Mercury levels in fish in the Everglades have dropped substantially over the past decade, which may be directly related to the control and eventual cessation of mercury discharges by local power plants and incinerators, according to a study released this month by the Florida Department of Environmental Protection (DEP). The findings have led some researchers and organizations to call for immediate cessation of mercury-producing activities elsewhere, in order to create almost-immediate local benefits. However, the connection between fish recovery and the closure of the plants is not definite, and other sources of mercury may potentially offset the benefits of local controls. This mercury problem haunts the Everglades and its restoration. Birds and fish bioaccumulate the toxic metal in the form of methylmercury, building it up in their bodies with everything they consume, and then adults bequeath it to their offspring, which might suffer birth defects or other disorders. A tiny amount of mercury  less then a part per trillion  in the background signal of an ecosystem is more than enough to have toxic effects (see Geotimes, August 2003). 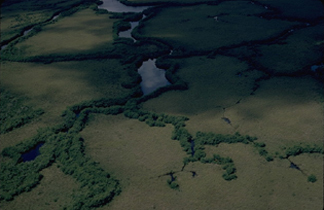 Aerial view of the Everglades National Park, where birds and fish have been plagued by high levels of mercury. Photograph courtesy of the National Park Service. Although mercury is present naturally, the highest impact comes from the anthropogenic release of the element in three different forms, each with different paths. Of mercury ejected into the atmosphere, the most active and damaging is the oxidized form, Hg II, which more readily converts to methylmercury once it enters an ecosystem. The unique environment of the Everglades seems to facilitate that conversion  for example, researchers have linked increased sulfur additions from sugarcane crops to the creation of methylmercury  by flushing in new sources of mercury daily, in water and air. The Florida report shows an almost one-to-one correlation between mercury in the system and in largemouth bass, a top predator fish. Tom Atkeson, the program administrator and a mercury specialist with the Florida DEP, presented some of the reports results to policy-makers and concerned citizens this month, in a Capitol Hill briefing sponsored by the Environmental and Energy Study Institute. He said that in 1995 and 1996, the majority of mercury deposition tended to be from local sources. During the late 1980s and early 1990s, Florida's power plants and incinerators cut down their mercury emissions, dropping to almost zero by 1999. Today, almost 10 years after those first efforts, the decrease in fish mercury loads has halved, according to DEP monitoring. "The system is responding more quickly than previously thought," Atkeson says. Robert Mason, of the University of Maryland's Center for Environmental Science and Chesapeake Biological Laboratory, says that "response time in Everglades is much more rapid than it would be anywhere else." The system response time, he says, is due to the combination of warmer temperatures and higher biological productivity, along with a high ratio of sediment surface area to water volume because it is so shallow. Though the decrease in mercury in fish may be attributable to shutting down incinerators and other local sources in the early 1990s, global sources today provide much more than half the dose of mercury to the Everglades  more likely 80 to 85 percent of the load, says William Landing, a chemical oceanographer at Florida State University, Tallahassee. "Despite dramatic reductions in the last 15 years, that hasn't changed deposition in 10 years," he says. "The bottom line is that in southern Florida, the dominant source is long-range transport" of mercury releases elsewhere on the planet, according to recently collected atmospheric data. The Florida DEP has not yet settled on an atmospheric model for mercury deposition. However, says David Krabbenhoft, of the U.S. Geological Survey in Middleton, Wisc., the aquatic cycling model from the Florida report "is an excellent model, put together right," for a system that is very difficult to understand. "The fact that the model matched the decline amazingly well basically makes me a believer," Krabbenhoft says. "But I have some hesitations," he continues, most notably because of a window of data that is lacking between the first deposition decreases (when power plants and other sources first started cutting emissions in the 1980s) and later decreases in fish, from measurements beginning in the mid-1990s. Ideally, Krabbenhoft says, monitoring in 1985 would have enabled the DEP scientists to quantify the response to the decrease in load. "We don't have that  instead, we have sediment cores and time series in fish and birds" from which to draw conclusions, he says. He also notes how difficult it may be to extrapolate from Florida, which can be considered an end member in atmospheric and environmental conditions in relation to the rest of the United States. "South Florida is number one in most cases for both concentration and deposition rates," he adds. "We don't know why that is." Atkeson also says that there are a number of "peculiar things" about Florida that cannot translate to other regions, from incinerators sitting next to wetlands to the panhandle's unique atmospheric circulation patterns. Nevertheless, Atkeson says, his take-home message is that yes, there is an overarching mercury cycle that effects the Everglades, "but under that umbrella, there's considerable room to make a difference."